Spousal RRSPs are income splitting vehicles available to Canadians. Unfortunately, they are often misunderstood and underutilized. 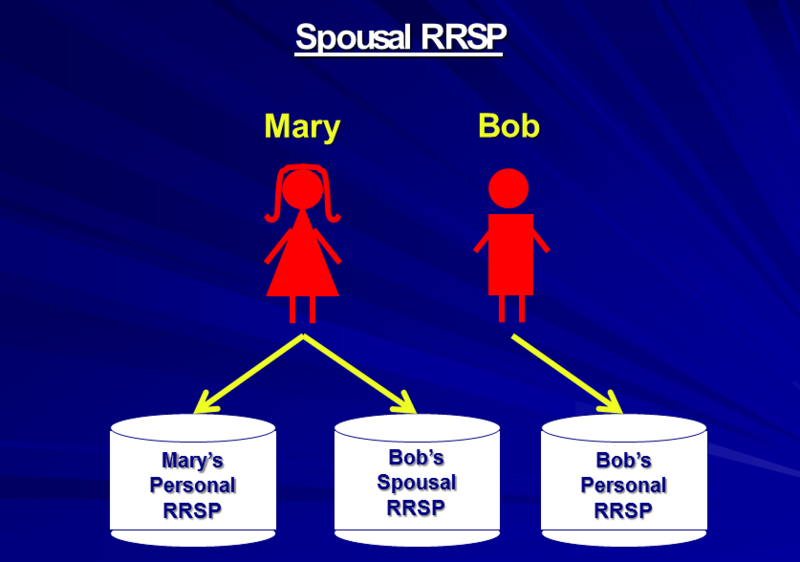 A spousal RRSP is like an RRSP in that it is a type of registered account. You often hear people talk about “buying RRSPs” but you can’t actually buy an RRSP (or a spousal RRSP): they’re accounts not investments. I like to think of an account like a bucket. Your money goes into the bucket and then, once it’s inside the bucket, you can choose to leave it in cash or you can invest it (by buying stocks, bonds, mutual funds, ETFs etc.). So if you have an RRSP account, you have a bucket. A spousal RRSP is a different kind of bucket and one person can have a spousal RRSP as well as a personal RRSP. The key difference between a spousal RRSP and a personal RRSP is that with a spousal RRSP, one spouse (or common-law partner) is the owner of the account and the other spouse (or common-law) is the contributor to the account. With a spousal RRSP the contributing spouse or partner gets the tax deduction for any contributions made to the account, and contributions can be made up to the contributing spouse’s personal CRA limit. Spousal RRSPs work best when there is lots of disparity in the amount of post retirement income between spouses: they give people the opportunity to push retirement income from a spouse in a high tax bracket into the hands of a spouse with lower income. Let's look at an example of an Alberta couple, Mary and Bob. Mary is the higher income earner, with an annual income of $65,000. Her spouse, Bob, has a lower income of $35,000. If Mary contributes the maximum amount she can to her RRSP and Bob contributes the maximum he can to his RRSP, Mary should have significantly more money in her RRSP account at retirement. Let’s imagine that they have 20 years until retirement and continue to earn the same amount each year. Mary can contribute a maximum of 18% of her earned income ($11,700) per year to her RRSP and Bob can contribute 18% of his earned income ($6,300) per year to his RRSP. After 20 years, assuming a return of 6% per year, Mary will have almost twice as much in her RRSP ($456,000) as Bob will have in his RRSP ($245,000). This disparity in assets can easily translate in a disparity of income in their retirement. With retirement savings totaling $700,000, the ideal situation for Mary and Bob is to have their RRSP assets split equally ($350,000 each) so that they’re each drawing the same amount of income and are in the same marginal tax bracket. Mary’s Personal RRSP where she makes the contribution, she owns the account and, upon withdrawal, she gets taxed. A combination of 1 and 2 with the total contribution amount based on Mary’s maximum RRSP limit. If the goal is to even out their retirement savings, then Bob would continue to contribute $6,300/year to his personal RRSP and Mary would contribute $9,000 to her personal RRSP and $2,700 to Bob’s Spousal RRSP. This gives them both a savings rate of $9,000/year and allows Mary to maximize her RRSP contribution limit while moving money from her current income to Bob’s future income. The definition of a spouse now includes common-law. If you are over the age of 71, you can contribute to a spousal RRSP as long as your spouse is not over 71 years of age. The maximum contribution allowed to a spousal RRSP is based on the maximum contribution limit of the contributor. In the previous example, the most Mary could put into Bob's spousal RRSP each year is her limit of $11,700. You must be aware of the rules of attribution. The rule of attribution states that if you withdraw money from a spousal RRSP, the contributor will be taxed on the withdrawal if there has been a spousal contribution made in the year of the withdrawal or the two preceding years. For example, if Bob takes money out of the spousal RRSP in 2019, Mary would get taxed if she made ANY contributions to ANY spousal plan owned by Bob in 2019, 2018 or 2017. Taking point #4 into account, if you are nearing retirement (or a period where the receiving spouse will have little to no income), consider making the spousal contributions in December instead of January and February. For example, if Mary made a contribution to Bob's spousal RRSP in December 2018, Bob could take money out of the Spousal RRSP as early as January 2021 without any tax consequence to Mary. However, if Mary made the contribution one month later, in January 2019, Bob would have to wait an additional year, until January 2022, to avoid the attribution rules. Finally, it is more important to look at disparities in tax brackets than disparities in income. For example, if Mary's income was $85,000 and Bob's income was $55,000, there would still be a $30,000 difference in income but, if they were living in Alberta, they would both be in the same marginal tax bracket. The spousal RRSP has more merit when there is a difference in tax brackets at the time of contribution and the time of withdrawal. Proper income splitting requires good preparation and planning. Too often, I see couples nearing retirement realize that they should have made spousal contributions much earlier. Take the time to make some projections and do not be afraid to solicit the help of a financial advisor. With Pension Splitting Rules, do Spousal RRSPs Still Make Sense? Back in October 2007, the government introduced significant tax changes to income splitting rules. If you don't have a spouse, the new rules are not relevant to you. If you do have a spouse or common-law partner, the changes allow retirees the option to allocate up to 50% of their pension income to their spouse on their tax return to help reduce taxes. One-third of Canadians are part of a formal pension plan. As soon as these people start collecting their pension, they can split up to 50% of their pension with their spouse. However, if you happen to be one of the many Canadians who doesn’t belong to a pension plan, the pension splitting rules also allow you to split your RRIF income with your spouse, but only after the age of 65. In other words, if you are 65 or older and you start to withdraw income from your RRSPs through an RRIF or annuity, you can split up to 50% of that income with your spouse. Pension splitting is great for couples in retirement because it means a lot of potential tax savings. However, if you’re under 65, the only way to take advantage of pension splitting is if you have income from a pension plan. Prior to the new pension splitting rules, the main way retirees could do any sort of income splitting was through spousal RRSPs. Although Spousal RRSPs may have lost some of their allure due to the expansion of the pension splitting rules, there are still situations where spousal RRSPs can provide a valuable benefit. Ken and Ally both plan to retire at the age of 60. Neither is part of a pension plan and Ally is the higher income earner. If Ally puts money into her RRSP and then retires at 60, she will have no ability to split her RRSP or RRIF income with Ken until she turns 65. If Ally contributes to Ken’s Spousal RRSP, he will be able to withdraw money from that account when Ally is between 60 and 65. Therefore, spousal RRSPs become very important to tax planning for anyone who plans to retire early. Larry is 71 and can no longer put money into RRSPs. However, because his spouse, Melissa is 64, he can still put money into her spousal RRSP to get a tax deduction. For younger couples, spousal RRSPs can be advantageous when using RRSP savings to buy their first home. In this example, Richard is the only income earner as Jane is still going to school. Putting money into both a personal RRSP and a Spousal RRSP, can allow Richard and Jane to borrow up to $50,000 from their RRSP accounts ($25,000 from Richard’s personal account and $25,000 from Jane’s spousal account) towards the purchase of their first home. At the end of the day, even with the new pension splitting rules, spousal RRSPs still have a place in retirement planning and income splitting. These examples accentuate the importance of individual planning. Even though the new pension splitting rules have been in place for over a decade, there is still a lot of confusion about how they work and how they affect couples in retirement. Everyone has unique circumstances so plan accordingly. When in doubt, seek help and advice from professionals. I like your advice, but I have no clue how Mary contributes $11,700 a year and makes $815,000 in 20 years. If you can do this, please be my financial advisor. Hey Scott! I had a good chuckle at your comment myself. This article was written in 2000 and the rate of return used was 10%. Back then people thought that was low but you are right … times have changed a little since the hey days of the 1990’s. Whether you you use 10% or 5%, the disparity is not different but thanks for stopping by and commenting! Thanks for the reply. It sure is depressing these days. I’m 38, have 100k in RRSPs, contribute around $15000 annually, and yet I’m worried about the future. There just doesn’t seem to be good returns out there, unless you really know what you’re doing, which 97% of us don’t..
Hi Erin. Looks like you didn’t get a response from Jim. If you have used up all your contribution headroom on your own RRSP, you cannot contribute to a spousal for your husband. But you can give him money to contribute to his own. He will get the deduction. Hi Jim, I absolutely LOVE your site – you’ve got so much great information here! I’m in a situation due to some unforeseen circumstances where my spousal RRSP may end up actually being a bit too large compared to my own now. Can I use the attribution rules in my favour by intentionally withdrawing funds from my spousal RRSP within 3 years of my last contribution to even things out a bit? If I did this, would it get me red-flagged with the CRA? Thanks! Jim, Question on point #3: can Mary contibute the 11,700. to her plan AND a max of 11,700. to the spousal plan? Or is it a total of 11,700. I earned about 27K this year and my wife earned 85K+. I expect to make significantly more in the future and already have about 60K in my RRSP. My wife has a pension so really won’t need to add any more to her RRSPs so she should have lots of RRSP room (as will I) in the future. My question is this: Does it make sense for me to withdraw 10K from my RRSP and take a tax hit of about 20%, give this $8000 to my wife and she can put it, and the tax deduction she derives from it (8000 * 1.34) = 10,720 into a spousal RRSP for me. I understand I couldn’t touch it for 3 years but I’m more than fine with that. This seems a bit of a no brainer to me. Am I missing something? Seems like an easy way to make $700 for about an hour of paperwork. My wife & me have a lot of rrsp room. I earn $95000 a year and my wife stays at home with no income. Am I eligible to make a spousal rrsp contribution, say $10000 a year? I just wonder if there is any restriction about contributing to spousal RRSP the year after the withdrawal? For example, if I made a withdrawal from my spousal RRSP this December of 2014; can my husband make a contribution to my spousal RRSP in January of 2015 and have the tax benefit for the tax year of 2014? Yes he can make a contribution in Jan of 2015 as long as he has unused RRSP contribution room. My husband has an RRSP and I have a spousal RRSP that he has been contributing to. This year may be the first year it would benefit me to contribute to my own RRSP. Do I have to open a 3rd separate RRSP account or can I contribute to the spousal RRSP account that is in my name? It would be interesting to know how you’re earning 100K… What industry? Sorry but my question wasn’t very clear. It is the taxation that I’m wondering about. Graphic Arts in the packaging industry. Thanks Dave, it does help. I’ll be sure to book mark the site. Hi Jim – just a question on how to handle tax filing for spousal RRSP’s. I have a spousal RRSP set up that will use my husband’s excess contribution room but the monies are from my own pay deductions with an employer matched contribution. The issue is that the RRSP benefit from my employer will be reported on Box 40 (taxable benefit) of my T4. How do I report my earnings properly if those funds have been allocated elsewhere? Love your articles. Your article didn’t mention anything about merging a wife’s existing personal RRSP with a spousal RRSP set up in her name. The personal RRSP is much smaller than the spousal and merging them together would seem to make sense. Assume that no contributions have been made to either one for at least 7 years. If they merge into one spousal, does the merging constitute a spousal contribution? Would you care to comment on this? Many thanks. Ted, I can speak from experience… Even though I have not made a spousal contribution to my husband’s SRRSP account in over 16 years, TD did not allow him to merge them together into one account…. Something about rules. Maybe when they become RRIFs? I have a question about spousal RRSP’s. I earn over 100k so I know I can contribute aprox 18k to my RRSP. I have over 100k of unused RRSP contributions left over from previous years. I want to contribute as much as possible this year (2018) to both my and my wife’s spousal RRSP. Can you let me know what my max contribution would be to my RRSP and to a spousal RRSP? I have updated the article to reflect a 6% return and current rules. When I updated the article, the changes to the rate of return did not change but it is not updated properly. My apologies. One other possible benefit of a spousal RRSP if one spouse is somewhat younger than the other is that when it comes time to make withdrawals at age 71 for the older spouse, the amount that is in the (younger) spouse’s spousal RRSP is not included in the min withdrawal calculation thereby lowering the amt which must be withdrawn at least until the younger spouse reaches 71. Jim. Question about point #4. Does attribution still apply if RRSP is converted into a RRIF? Secondly, does this only help after both parties are 65? Great article, extremely helpful. Thanks! Jim, I’ve just received an email (Feb 13 2019) referring to your “new” article and it is woefully out of date! 11% per year growth?!! And you’ve only replied to 1 comment. How many other points are out of date? Have you linked it to this article in error? Sorry about the confusion. I have updated the article to reflect a 6% return and current rules. When I updated the article, the changes to the rate of return did not change but it is not updated properly. My apologies. My only comment would be for you to date your articles. Some of them are older, and it can get confusing with changing rules. Very sorry for the confusion. We work hard to try and keep articles current. Where do I sign up? I wonder how many time in all history was there a 20 year period with an 11% return each year? Sorry Peter. My bad. I have updated the return to 6% instead. However he must have either earned income or unused contribution room in order to qualify. be able to contribute to a spousal RRSP except for any unused contribution room from previous years. Yes, Larry must have RRSP contribution room which is based on earned income. I made a mistake and contributed a very small amount into a spousal rrsp in 2018. We have other money in a spousal and was hoping to start withdrawing some of this money in 2020. With this small contribution mistake in 2018….does this mean that we can’t touch the spousal rrsp until 2021 so the contributor does not get taxed on these withdrawals? If yes, can I ask the bank to change the mistake spousal to my own rrsp? According to the rules, any contribution made to any spousal RRSP would extend the 3 year period. You should talk to your financial institution or advisor for a proper response. My understanding is that regardless of it being a spousal RRSP, either party can contribute and either party can get the tax receipt. Thanks all! I made the small contribution in 2018 , I guess I should wait until 2021 to start the withdrawal plans. Hello, I have question in terms of the spouse making a withdrawl. Situation: John earns approx. $130K per year, Mary earns $0 (Both 40 years old). John has contributed approx. $30K to a spousal RRSP 4 years ago and recognized the deduction. John continues to contribute to both his own and spousal RRSP. Not for retirement, but just for cash needs, does it make sense for Mary to withdrawl $5-10K to be taxed at the basic federal/prov amount and much less than the credit John received? Thank you in advance. 1). John has 130K employment income and claims wife. She has no income – he pays $31739 tax. She pays no tax. Thanks for your reply Dave. If you consider the tax return John would have received on the contribution at his marginal rate(40%) ex 10,000*.4= $4000. Then upon withdrawal (2k or 20%) impact, would this be considered effective income splitting? If she withdraws 10K and you contribute 10K . She pays nothing and you’d pay 29629. If she does not withdraw 10K and you contribute 10K you’d pay 27669 tax. In my opinion its not effective income spitting. But again what ever you do be aware of the spousal rules.